When I was in college, I took a photography class that ended up being one of my favorite classes ever. The teacher had once been a former assistant football coach as well as the former athletic director for the school. So even though I actually learned a LOT in the class, it was one of those classes that football players take to boost their GPA. In class there were at least 6 or 7 extraordinarily tall muscular men that had necks the size of Paul Bunyan, and for a while, whenever we had a project that involved going into the dark room with one of them, I was… let’s just say, more than a little cautious. Eventually, I discovered that they were pretty much teddy bears, and more often than not, extremely bright as well. For one assignment, we had to design a personal calling card. One of the football players and I had been discussing how in the game of football, you always have to be prepared for the play to change and then adapt to that in the middle of what was originally planned. Being all of twentysomething and full of myself, I thought it would be cute if I used that for my personal calling card. On the card I had my name, a bunch of random arrows pointing everywhere, with the tagline “Expect the Unexpected.” At that point in my life, I thought I was mysterious, random and unpredictable, when in reality, I was extremely reliable. I was – and still am – a good girl. Always doing what’s right and expected of me. (Working on that.) Not that I want to be the bad girl, but it’s exhausting always trying to make everyone else happy… Raise your hand if you understand. Still… “Expect the Unexpected” is what life is all about. Nothing is ever really foreseeable in the short run. Days will not happen as planned. Plans will not happen as planned. Life will not happen as planned. For instance, today, I planned to mow; it’s raining. I thought the “perfect” buyers were coming to look at our house today so I got up at 5 a.m. this morning to clean. They ran out of time and had to get back to NY before they could see our home. I thought I would go pick a few tomatoes from my garden and a runaway horse showed up in my yard. I walked him home. Plans…. what you make while life is happening, right? I mean, the grass will still be there tomorrow so I can spend a rainy day reading. The potential buyers didn’t come look at the house, but hey – my house is clean! I got fresh tomatoes and a visit from a beautiful 800+ pound creature. When you expect the unexpected, life can be good. Beauty standards around the world through Photoshop. 4 tips to eat healthier. Why we need to stop fixating on what we eat. George Takei rates totally random Amazon products. Too weird to not be funny. You really DO look better in sunglasses. Here’s why. The NBA does good during the draft. Heartwarming video. Kandinsky is one of my favorite painters. Creative take of his work… on a salad plate. Because no matter how I try to use up all the food I buy, I still end up throwing some away. This is a genius idea from Germany – sharing your leftovers. Sounds gross, but trust me, read it. Kristin Armstrong always speaks truth to me. My son who loves dragons is too old for this now, but maybe if he ever has a dog? People are always impressed by pull-apart breads. I’ll be making this lemon one soon. How do you feel about tattoos? No matter which way you fall, you should watch this. Ask my family. I would eat salad for breakfast, lunch and dinner. Making this one this week! Salty caramel brownies with pretzel crust: Um…. YES!!! Making these for the 4th! This is a heck of a way to show your patriotism! Terrific post. Lots and lots of goodies here. 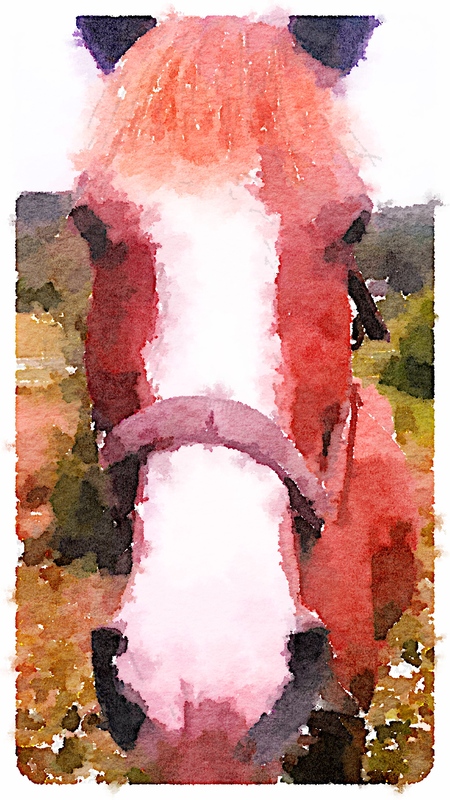 Your painting of the horse is the best!